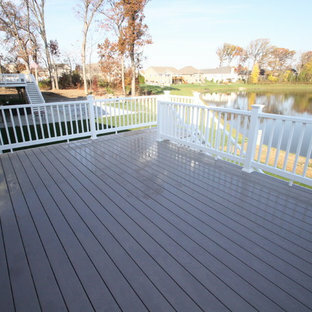 Fiberon ProTect Advantage Composite Decking in Chestnut and Horizon Railing built in Salisbury, North Carolina by Deckscapes (Pineville, North Carolina). We completed this exterior renovation just in time for our clients to enjoy the last days of summer. 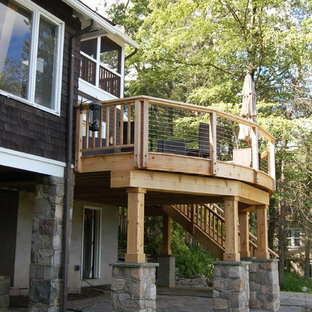 In order to bring new life to this backyard, we built a multi-level deck using Trex composite decking. 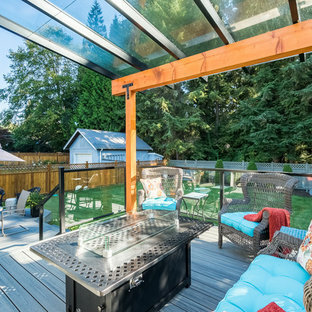 The home-owner wanted a bit of overhead protection for the upper deck so we had a local glass company install a frameless lami-glass canopy, which we supported with fir beams. They completed the design for the upper deck with side-mounted glass guard rails for a cleaner look. Deck to sunken backyard patio. By Design Services Northwest Inc.
By RailPro of Oregon, Inc.
Franklin Lakes NJ. Outdoor Great room with covered structure. A granite topped wet bar under the tv on the mahogany paneled wall. This fantastic room with a tigerwood cieling and Ipe columns has two built in heaters in the cieling to take the chill off while watching football on a crisp fall afternoon or dining at night. 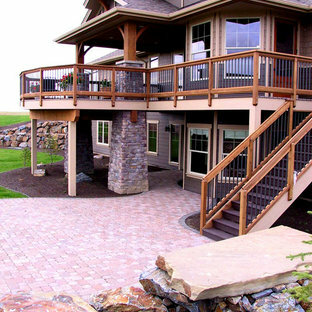 In the first picture you can see the gas fire feature built into the round circular bluestone area of the deck. A perfect gathering place under the stars. 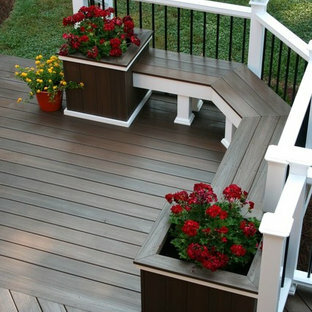 This is so much more than a deck it is year round outdoor living. 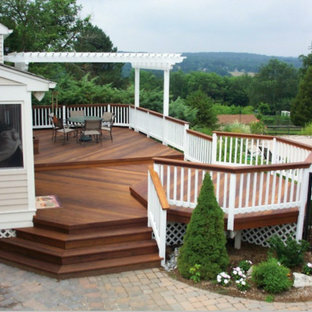 Beautiful double deck and porch with white columns and brazilian hardwood in Marietta, Georgia. Overlooks wooded area in a valley. 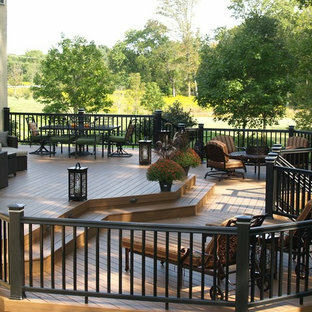 At Atlanta Porch & Patio we are dedicated to building beautiful custom porches, decks, and outdoor living spaces throughout the metro Atlanta area. Our mission is to turn our clients’ ideas, dreams, and visions into personalized, tangible outcomes. 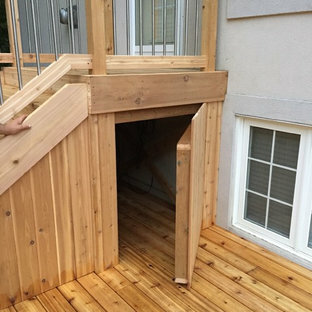 Clients of Atlanta Porch & Patio rest easy knowing each step of their project is performed to the highest standards of honesty, integrity, and dependability. 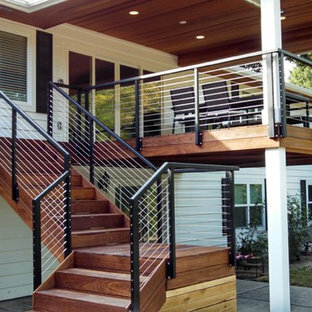 Our team of builders and craftsmen are licensed, insured, and always up to date on trends, products, designs, and building codes. We are constantly educating ourselves in order to provide our clients the best services at the best prices. 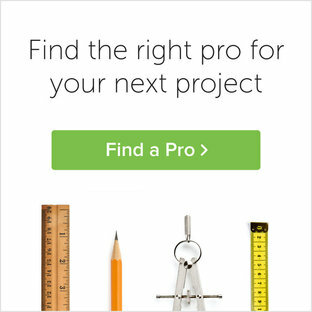 We deliver the ultimate professional experience with every step of our projects. After setting up a consultation through our website or by calling the office, we will meet with you in your home to discuss all of your ideas and concerns. After our initial meeting and site consultation, we will compile a detailed design plan and quote complete with renderings and a full listing of the materials to be used. Upon your approval, we will then draw up the necessary paperwork and decide on a project start date. From demo to cleanup, we strive to deliver your ultimate relaxation destination on time and on budget. Examples of Fall and Spring containers designed for a long time client. By Bellingham Millwork Supply Co.